Innahura Maldives Resort, the latest addition to the portfolio of the leading resort operator Crown & Champa Resorts has opened. 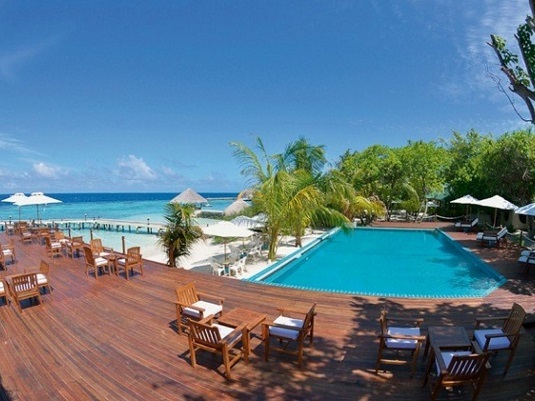 Located in the northern Lhaviyani atoll, Innahura island introduces a more affordable Maldives resort to the market. This newly built three-star island resort boasts 78 Beach Bungalows complemented by an overwater bar, main bar and a wholesome buffet style beachfront restaurant. 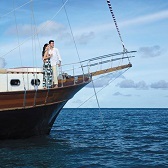 Innahura’s approach is a cost-effective option for travellers to the Maldives who want a laid-back holiday. A fun and easy atmosphere with a touch of local Maldivian flavours and minimal fuss encapsulates Innahura’s approach to getaways and the resorts purposefully crafted all-inclusive approach, AI Easy. The AI Easy programme is an affordable package which guests can enhance with additional purchases at any time with their favourite drinks, snacks, experiences and activities. 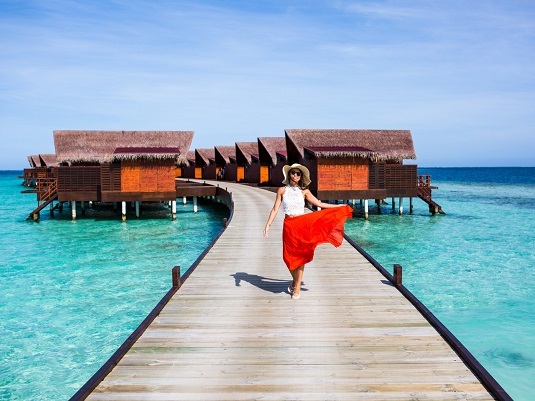 “We wanted to open up the Maldives to a whole new market, in order to ensure Innahura is an affordable option we decided to give travellers the quintessential Maldives holiday alongside the power to choose what they want in their holiday AI package,” Martin Vossen, CEO of Crown & Champa Resorts, was quoted in a previous statement saying. This expansion increases the collection of resorts operated by Crown & Champa Resorts — a leader in the Maldivian hospitality industry with over 40 years of experience to nine. The Crown & Champa Resorts diverse collection of resorts are Hurawalhi Maldives, Kudadoo Maldives Private Island by Hurawalhi, Innahura Maldives Resort, Mirihi Island Resort, Komandoo Maldives, Veligandu Island Resort & Spa, Kuredu Resort Maldives, Vilamendhoo Island Resort & Spa, Meeru Island Resort & Spa, and one city hotel, Champa Central Hotel. 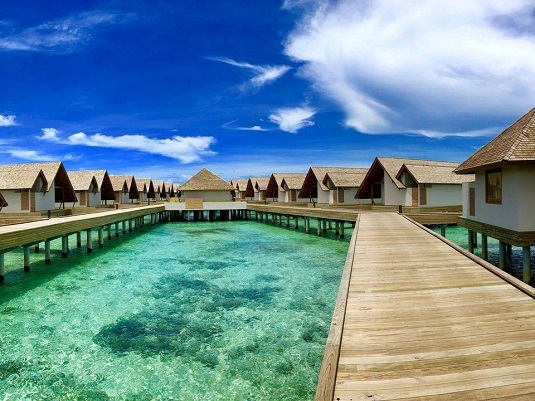 Faarufushi Maldives, the newest resort of the leading Maldivian resort operator Universal Resorts, was opened. 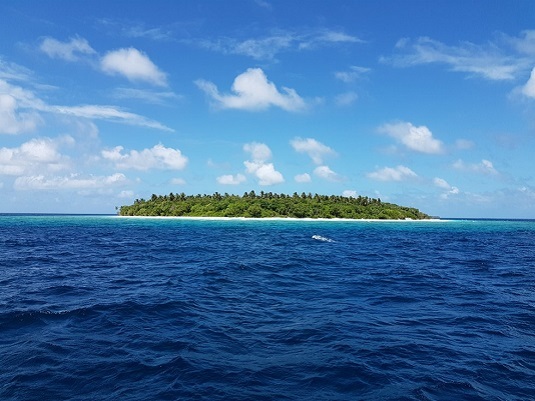 The resort is set on the island of Faarufushi in the northern Raa Atoll, with just a scenic 50-minute journey by seaplane or off a domestic flight to Ifuru Domestic Airport from the main Velana International Airport. Faarufushi, a member of the Small Luxury Hotels of World Alliance welcomes guests with 80 spacious villas that offer a striking realisation of contemporary design amidst a naturally stunning seascape. Ten Beach Bungalows and 27 Beach Retreats with Pool are cocooned around the island in addition to 39 sleek Ocean Retreats with Pool stilted over the azure lagoon of Faarufushi. Three Ocean Suites with Pool and the Island Residence with Pool offer the ultimate sanctuary with an expansive infinity pool overlooking at its very own stretch of the Indian Ocean. Indulgent dining choices are offered in a modern and most unpretentious environment. Universal Resorts operates one of the largest resort collections in the country, including iconic properties Kurumba Maldives, Velassaru Maldives, Kuramathi Maldives, Baros Maldives, Kandolhu Maldives, Dhigali Maldives, Maafushivaru, and Milaidhoo Island Maldives. 11 new resorts came into operation in 2016, followed by 15 new resorts in 2017 and 20 new properties in the last year. Maldives will welcome 20 new resort openings in 2019. Meanwhile, the first integrated tourism developments in the Maldives — Emboodhoo Lagoon project and Rah Falhu Huraa lagoon project are underway. Qatar Airways announced that it has added an additional daily flight to the Maldives, providing its passengers with even more flexibility and choice for getaway to the tropical island paradise. The new service to Malé Velana International Airport, which is set to launch on 28 October 2018, is part of the award-winning airline’s continued expansion in Asia. Qatar Airways currently operates 14 flights per week from Doha to the Maldives. The additional service will be operated by both the A330-300 and A320-200 aircraft and will take the number of weekly flights to 21. In October 2017, the airline upgraded its double-daily A330 service to the Maldives with an A350 aircraft, featuring a total of 283 seats, with 36 Business class seats and 247 in Economy Class. “We are delighted to announce the addition of a third daily flight between Doha and the Maldives, one of our most popular holiday destinations. We believe that a luxurious travel experience isn’t just about the destination, but about the whole journey itself,” said His Excellency Mr. Akbar Al Baker, the Group Chief Executive of Qatar Airways. Qatar Airways was named ‘World’s Best Business Class’ by the 2018 World Airline Awards, managed by international air transport rating organisation Skytrax. It was also named ‘Best Business Class Seat’, ‘Best Airline in the Middle East’, and ‘World’s Best First Class Airline Lounge’. Cenizaro Hotels & Resorts’ second property in the Maldives, is set to open its shores in January 2019 with 173 spacious beach and water villas. Set on Gaafu Alifu Atoll, the property is adjacent to Cenizaro’s first property, the Residence Maldives at Falhumaafushi. 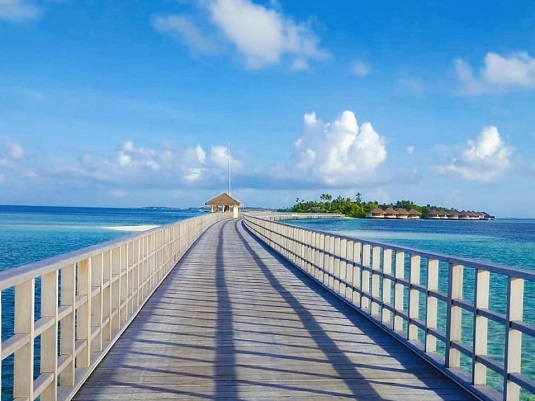 The two resorts will be connected by a bridge – enabling guests to travel between the two with ease – and forming one of the largest resort offerings in the Maldives. Aimed at families, Dhigurah introduces 12 new two-bedroom beach and water pool villas, with more on-land options, perfect for younger children. Dining options include all-day dining at the Dining Room, the resort’s beachfront restaurant and Li Bai, the resort’s signature Cantonese restaurant, sister to the celebrated Li Bai in Singapore, serving exquisite classic Chinese dishes. “With the Residence Maldives at Dhigurah we are creating a new offering for our guests,” said Gary Xie, director for Cenizaro Hotels & Resorts, commenting earlier on the new property. “The hotel will – as always – be an authentic expression of the Residence philosophy; with its own story to tell and a combination of both Maldivian and global influences to give it a unique sense of place. 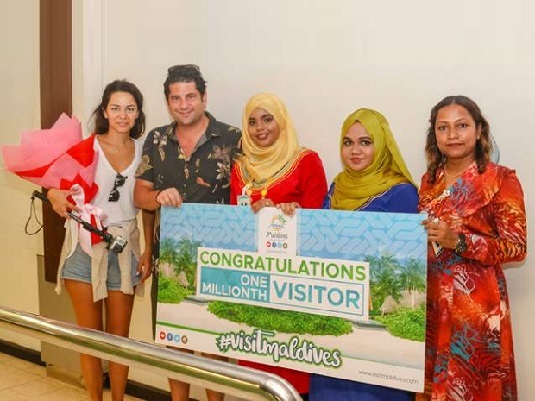 Maldives welcomed the one millionth visitor of 2018 on Sunday, 9th September. At a media event held at Velana International Airport on Sunday morning, officials from the Maldives Marketing and Public Relations Corporation and the Tourism Ministry welcomed Koralp Guner, as the one millionth visitor of the year, who arrived on Turkish Airlines Flight TK730 with his wife for their honeymoon. Guner, who is an American national, and his Turkish wife were also awarded with a complimentary 5 night holiday package sponsored by Mövenpick Resort Kuredhivaru Maldives along with complimentary transfers by Trans Maldivian Airways. Total arrivals to the Maldives last year stood at 1.3 million. The government has announced an ambitious target of a record 1.5 million tourist arrivals this year. Maldives Association of Travel Agents and Tour Operators (MATATO) hosted Maldives Travel Awards Guesthouse Edition 2018 on Friday, 7th Sep. Winners for the Guesthouse Edition were selected from a combination of popular vote (60 percent) and traveller ratings (40 percent), which was based on data provided by world’s largest travel website Tripadvisor. 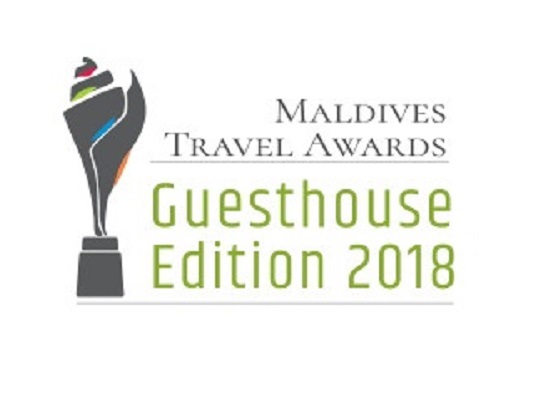 Introduced last year, the Guesthouse Edition builds on the recognitions awarded to guesthouses by MATATO as part of the Maldives Travel Awards, and celebrates the outstanding performance of the guesthouse sector. Marriott International has announced the forthcoming debut of Westin Hotels and Resorts in the Maldives with the opening of The Westin Maldives Miriandhoo Resort in October 2018. Developed by Belluna Co. Ltd of Japan and Asia Capital PLC of Sri Lanka, The Westin Maldives Miriandhoo Resort is set to herald the Westin brand’s wellness positioning in the Maldivian oasis. Nestled on a beautiful coral island in the Maldives only UNESCO Biosphere Reserve of Baa atoll, The Westin Maldives Miriandhoo Resort will feature 70 villas and suites, 41 on island and 29 overwaters. Poised over the sea on stilts and with an area of almost 200 square metres each, the overwater suites are amongst the largest a resort has to offer in the Baa atoll region. Westin, a brand acquired by Marriott through its merger with Starwood Hotels and Resorts, runs hotels and resorts that are designed to enhance guests’ well-being through revitalising amenities and innovative programmes that help them be at their best while on the road. 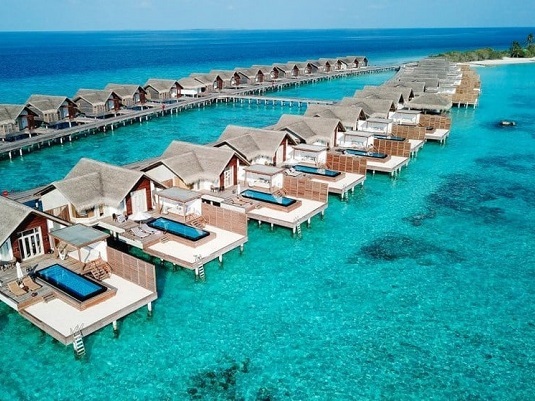 Marriott runs several resorts in the Maldives, including The St. Regis Maldives Vommuli Resort, Sheraton Maldives Full Moon Resort and Spa and W Maldives. 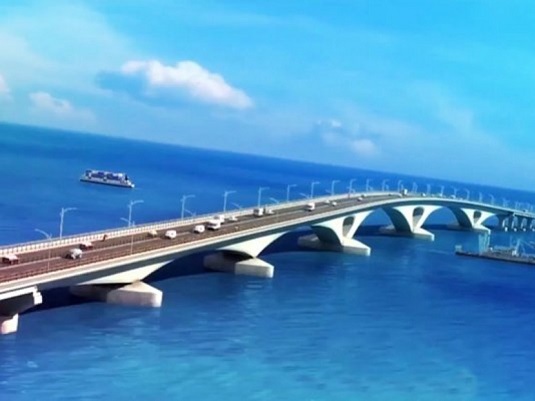 The China-Maldives Friendship Bridge, the first cross-sea bridge in the Maldives, was opened on 30th August evening. Connecting capital Male and neighboring Hulhule island where the Maldives' main international airport is located, the bridge makes it possible for locals and tourists to transfer between the two islands on land within five minutes. The over water bridge will stretch out to 1.39 kilometers in length and 20 meters in width. The construction of the bridge started at the end of 2015. SilkAir, the regional wing of Singapore Airlines, announces that it will be operating 4 additional weekly flights to Maldives starting March 27. With the additional flights, Singapore Airlines and SilkAir will fly a combined total of 18 weekly flights to the Maldives. 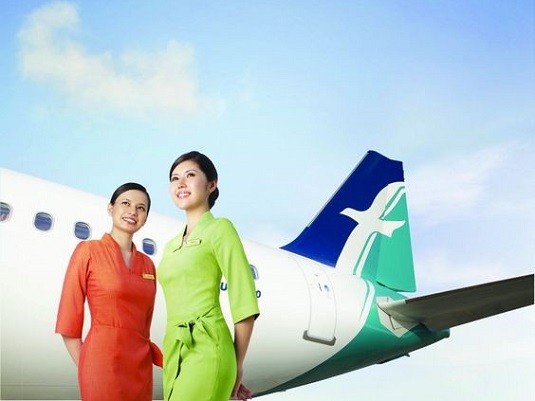 SilkAir launched its inaugural flight to the Maldives in October 2015, starting with a four-times weekly frequency, before increasing to daily flights from October 2016. With the upcoming additional flights in March, SilkAir will be operating 11 times weekly to the Maldives, reinforcing its strong confidence in inbound travel to Maldives. As the regional wing of Singapore Airlines, SilkAir operates the Singapore Airlines Group’s narrowbody fleet and extends the Group network by seeding and developing new, exciting destinations in the Asia Pacific. The airline took to the skies in February 1989 as Tradewinds the Airline, before evolving into SilkAir in 1992. In its early days, the airline catered to passengers holidaying in exotic destinations in the region, including Phuket and Tioman. As the carrier developed, regional business destinations such as Phnom Penh, Yangon and Kuala Lumpur were added. Today, the full-service airline operates about 400 weekly flights to 52 destinations in 16 countries. Recent additions to the network include Colombo, Sri Lanka (Apr 2017) and Hiroshima, Japan (Oct 2017). The airline currently has a fleet of 33 aircraft, comprising 3 Airbus A319s, 10 Airbus 320s, 17 Boeing 737-800s and 3 Boeing 737 MAX 8. Qatar Airways has announced plans to increase its frequency to the Maldives to triple daily flights for 2018-2019. 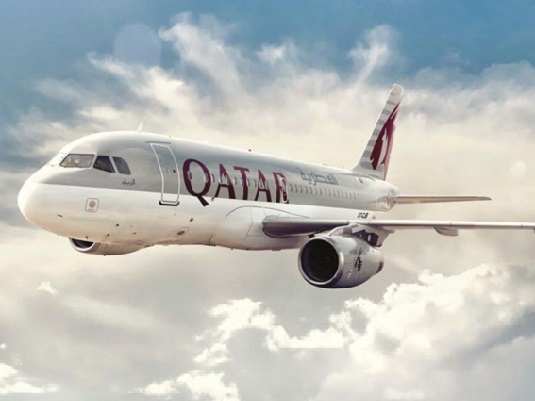 The announcement was made by Qatar Airways Group Chief Executive Akbar Al Baker, at ITB Berlin, the world’s largest travel trade show on Wednesday, 7th MArch. “Qatar Airways is tremendously excited to announce further expansion with a significant number of new destinations to be added to our extensive global network throughout 2018 and 2019. This is a direct reflection of our commitment to connecting travellers across all corners of the world in a way that is meaningful and convenient to them. We are committed to continuing our ambitious growth strategy, in order to be able to provide our passengers with as much choice as possible and to take them anywhere in the world they wish to go,” Al Baker told some 200 members of the international media in attendance. Qatar Airways currently operates twice daily direct flights to and from the Maldives. It has recently deployed the brand new A350 jet on its Doha-Male route, making it the first airline to deploy an A350 jet to a South Asian country. The airline will use a 280 seater A350 jet to fly between Qatar and Maldives until the end of March. Qatar Airways is popular amongst travellers from Europe who often transit in Doha before flying to the Maldives. 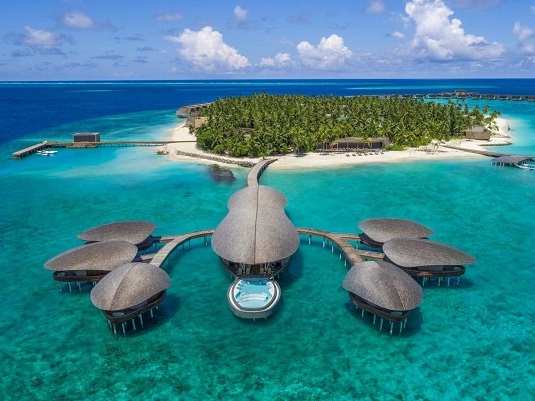 Sirru Fen Fushi, a brand new luxury resort in the Maldives, has welcomed the first group of guests, with plans to reposition it under AccorHotels’ Fairmont brand in April. Developed on the island of Gaakoshibee in the northern Shaviyani atoll and accessible by a 55-minute seaplane flight from the main Velana International Airport, Sirru Fen Fushi welcomed the first group of guests on Thursday. Offering 120 luxury villas on one of the largest resort lagoons in the Maldives, the stunning new property features the Maldives’ first underwater sculpture museum, created by British artist Jason deCaires Taylor. One of the world’s most celebrated ‘underwater naturalists’, Taylor’s work has been recognised by National Geographic as one of the top 25 Wonders of the World. This all-villas resort is ideal for both couples and families – and includes luxury tented villa accommodation in a verdant, star-lit grove. 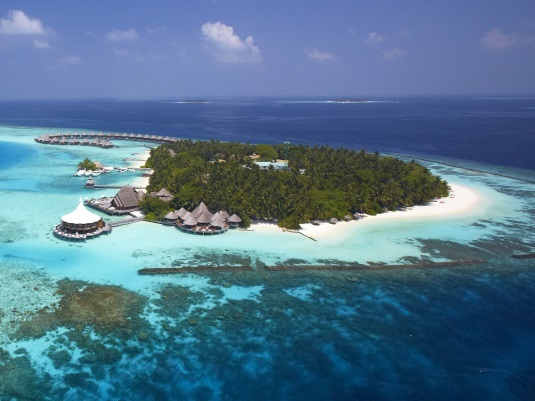 After two months of soft launching, Sirru Fen Fushi will be rebranded in April as Fairmont Maldives Sirru Fen Fushi. Four Maldivian resorts won The HolidayCheck Gold Award 2018. The winners are Kuramathi Island Resort, Kuredu Island Resort & Spa, Meeru Island Resort & Spa and Reethi Beach Resort. 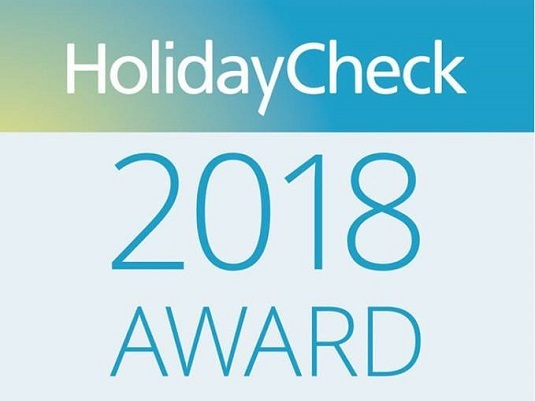 Eight other resorts also won the HolidayCheck Award this year. The winners include Holiday Island Resort, Embudu Village, Fihaalhohi Island Resort, OBLU by Atmosphere at Helengeli, Robinson Club Maldives, Summer Island Maldives, Vilamendhoo Island Resort & Spa and Veligandu Island Resort & Spa. The HolidayCheck Award is an annual hotel award that selects the most popular hotels in a specific region. The HolidayCheck Award 2018 was based on more than 900,000 guest reviews. The selection is based purely on the published ratings. The reviews considered for the award were the ones published on HolidayCheck between December 1, 2016, and November 30, 2017. The popularity ranking, an algorithm that compares the number of ratings, the overall rating and the recommendation rate, determines that the hotels that meet the minimum criteria are the 10 most popular hotels in each region. HolidayCheck is a renowned German travel review website that is available in 13 different languages and is one of the strongest neutral quality web pages in the world, particularly used by German-speaking travellers. To see the full list of winners please visit holidaycheck.de/holidaycheck-award. Hong Kong Airlines recently announced that it would begin operating a three-time weekly service to the Maldives starting January 16, 2018. 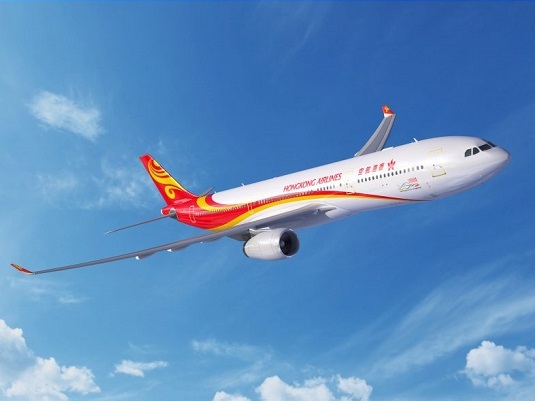 Tourist arrivals from the Asia Pacific region are expected to grow next year, with the commencement of direct flights by Hong Kong Airlines. According to Hong Kong Airlines, the flights are scheduled for every Tuesday, Thursday and Sunday; from Hong Kong to Velana International Airport, Malé. The flight time between Hong Kong and Malé is approximately six hours. A total of 511,081 travellers from the Asia Pacific region visited the Maldives so far this year, accounting for 45.5% of total arrivals, according to data from the tourism ministry. 265,417 Chinese tourists visited the Maldives from January to October, while the number was recorded at 28,689 in October alone. Chinese tourists account for 23.6% of the total 1.12 million tourists arrivals so far this year. Hong Kong Airlines was established in 2006 and covers nearly 40 destinations across the Asia Pacific and North America. It has also been awarded the internationally acclaimed four-star rating from Skytrax since 2011. It was also the winner for Asia’s Leading Inflight Service at the World Travel Awards 2015. For more details, please visit hongkongairlines.com. Air France on Thursday, 2nd November began operating direct flights to the Maldives. The maiden flight of Air France landed at the Maldives main Velana International Airport on 2nd November morning to a water salute. Air France will offer two weekly flights to the Maldives on departure from Paris-Charles de Gaulle. The airline will use a Boeing 777-200 jet equipped with the latest Air France travel cabins, and with a capacity of 312 seats, including 28 in Business, 24 in Premium Economy and 260 in Economy. Flights operate on Wednesdays and Saturdays on departure from Paris and on Thursdays and Sundays on departure from Male. The scheduled direct service by Air France is expected to give a much needed boost to tourist arrivals from France as well as from the whole of Europe. Despite France being an important source market for the Maldives tourism industry, numbers have become stagnant over the past months. According to the latest figures, arrivals from France observed an year-on-year increase of just 3.9 percent in the first eight months of the year. 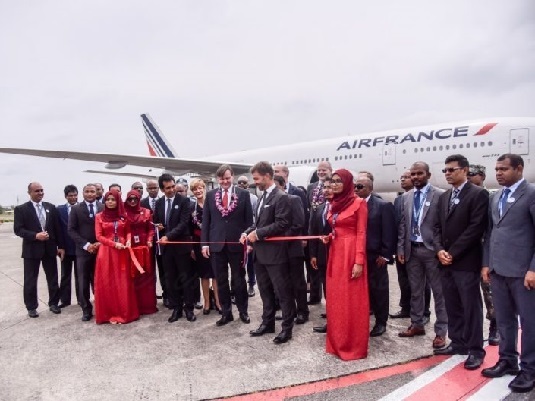 The flagship carrier of France is the latest European airline to begin direct flight operations to the Maldives. Italy’s flagship carrier Alitalia on Wednesday began its first ever scheduled direct operations to the Maldives. Air France and Alitalia are amongst the few airlines operating direct flights between Europe and the Maldives. Majority of travellers from Europe are now required to take transit routes on airlines such as Emirates and SriLankan Airlines. Scheduled direct operations by the flagship carriers of France and Italy come amidst announcements by several international airlines to increase flight frequency to the island nation ahead of the upcoming peak tourist season. Baros Maldives has been acclaimed as the Resort Hotel of the Year 2017 by Small Luxury Hotels of the World (SLH) at the brand’s International Conference in California. Small Luxury Hotels of the World is a collection of over 500 hotels in more than 80 countries around the world that offer the best locations, highest quality, personalised service and a truly authentic way to discover a destination. These prestigious annual awards are presented as the result of voting by discerning guests who are members of SLH’s loyalty programme and by luxury travel agents. Baros Maldives was also the runner-up in SLH’s Hotel of the Year Award as well as in four other categories: Best Gourmet Experience, Most Sensational Spa, Most A-List Suite Experience and the Mystery Inspectors’ Excellence Award. No other hotel or resort received the highest number of top-level rankings as Baros Maldives, according to a statement by the resort. “As curators of the very best small, luxury hotel experiences around the world, we are delighted to recognise these exceptional hotels that showcase our independently minded ethos in such a variety of creative, classy and culturally-relevant ways,” says Filip Boyen, CEO of Small Luxury Hotels of the World. Statistics by the Ministry of Tourism has showed that 42,900 tourists visited the Maldives from India in the first seven months of 2017, which is a 23% increase compared to the same period of last year. In July, over 5,300 tourists visited Maldives from India, which is a 13% increase compared to June 2017. Maldives is fast becoming a favored destination amongst Indian travellers with Indian booking websites citing surveys that notes Maldives amongst top five destinations most preferred by Indians. Indian tourists attributes to over 7% of total arrivals to Maldives, according to statistics. India is one of the main source markets to the Maldivian tourism industry with notable growth in arrival of Indian tourists to Maldives in the past couple of years. The leading global holiday company Thomas Cook has launched its first resort in Maldives, Smartline Eriyadu. Eriyadu, a resort earlier run by the local company Platinum Capital Holdings (PCH), was relaunched under Thomas Cook’s Smartline brand. Located in North Male Atoll and accessible by a 50 minute speedboat trip from the main Velana International Airport, Smartline Eriyadu has 76 rooms in 2 categories — Standard and Deluxe that reflect the typical Maldivian style and natural local materials like palm leaves and bamboo as well as the colours of this diving paradise. 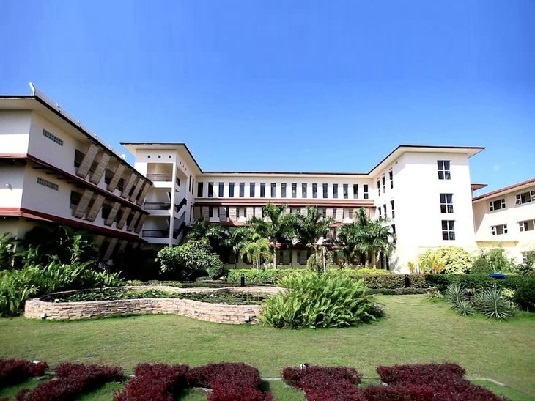 For dining, Smartline Eriyadu has a main buffet restaurant, which serves local and varied dishes with the influence of Asian cuisine, the Blitz Café and Bar, which features a comprehensive à la carte menu and a fully stocked bar, and a beach bar. Guests can also enjoy tailor-made dining options such as dinner at sunset and in-villa dining. With 21 of the most extraordinary dive spots in the world within reach, Smartline Eriyadu is the perfect place to explore the underwater world of the Maldives. The resort features a PADI-certified diving school and a water sports centre that offers a range of options, including banana boat, catamaran sailing, jet ski and wind surfing, as well as excursions such as big game fishing and sunset fishing. Recreational facilities at Smartline Eriyadu include a swimming pool, a wellness centre and table tennis. The UK-based Thomas Cook already runs 65 Smartline hotels in Bulgaria, Cyprus, Croatia, Cape Verde, Gambia, Greece, Spain, Portugal, Tunis and Turkey. The 3 and 4 star Smartline hotels are located in popular holiday destinations, close to the beach and surrounding hotspots. Grand Park Kodhipparu, the first Maldivian property of the Singapore based Park Hotel Group has opened. Located in the North Male Atoll and a 15-minute speedboat ride away from the main Velana International Airport, Grand Park Kodhipparu features a collection of 120 idyllic beachfront pool villas, breathtaking overwater villas and palatial two-bedroom villas − 65 of the 120 villas come with their own private pools and the five two-bedroom villas feature extensive private terraces. Designed by world-renowned hospitality design firm Hirsch Bedner Associates, the resort showcases sophisticated architecture, state-of-the-art interior and high ceiling of palm fringed roof. Contemporary exterior with Maldives’ traditional influence of wood and rattan, inventive rustic appeal and inviting peaceful atmosphere. Neutral tones, natural fundamentals and spacious social settings balances the unrivalled beauty of the cobalt sea and tranquility. The resort offers three restaurants and a pool bar, including the overwater Edge restaurant which offers a wide selection of international culinary creations, Breeze poolside restaurant and bar which serves lunch and light bites throughout the day followed by inventive cocktails and fine wines in the night, and the Firedoor speciality restaurant which offers grilled meats and fish coupled with the finest wines. To celebrate its opening, Grand Park Kodhipparu has also announced a limited-time opening offer of 50 percent off on beach and water villas. Park Hotel Group owns and manages 15 properties in eight countries and 11 cities. Named Best Regional Hotel Chain in the TTG Travel Awards for five consecutive years (2012-2016), the group endeavors to create unique and memorable travel experiences, and to bring joy to its guests as it continues to grow its footprint across Asia Pacific. A new seaplane terminal is being developed at the Maldives main Velana International Airport, Malé. The new seaplane terminal, which is expected to cost USD 30 million is a part of a USD 800 million mega project to expand and upgrade the Maldives’ main gateway Velana International Airport. The seaplane terminal currently in operation is to be moved out in order to make space for a new runway and a new terminal. The four-storey terminal will have state-of-the-art equipment and facilities, including lounges and restaurants. The reclamation of land for the new terminal on the reclaimed lagoon on the eastern side of the airport island of Hulhule is already completed. The new terminal will sit on 18,000 square metres of reclaimed land and the accompanying seaplane hanger will be built on an additional 14,000 square metre reclaimed land. Seaplane is the preferred mode of transport between the main Velana International Airport and resorts located in outer atolls. 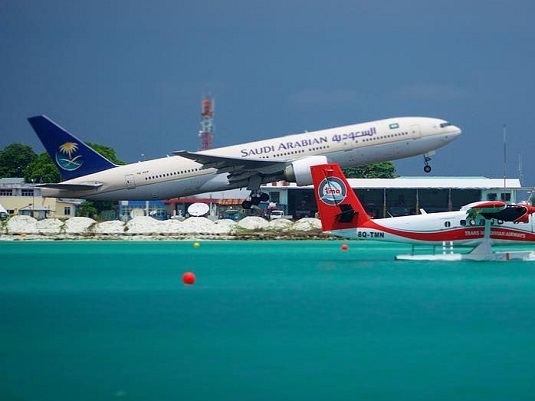 Two companies handle seaplane operations - flagship carrier Maldivian and the privately run Trans Maldivian Airways (TMA). The seaplane operators are investing heavily on expanding their fleets and operations. The expansion comes in-line with growing tourist arrivals and increasing bed capacity due to the opening of dozens of new resorts in the Maldives. Local laws allow tourism leases of up to 100 years. 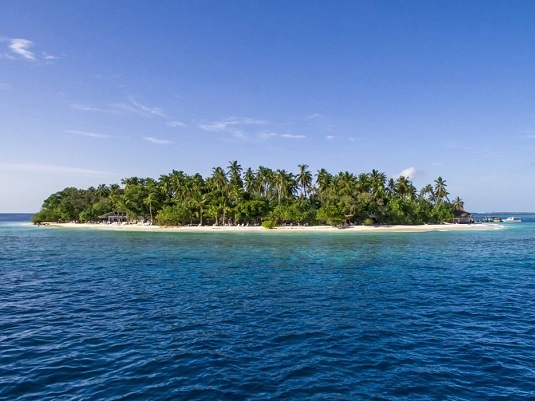 Over the past three years, dozens of uninhabited islands have been leased to local and foreign resort developers. Several international brands have entered into the market, increasing the number of resorts to 120. That number is set to increase as the government has announced the opening of some 20 new resorts by the end of this year. Along with the new resort openings come the challenge of increasing demand from budget travellers who choose guesthouses over luxury resorts that the Maldives is known for. The guesthouse sector has rapidly expanded with over 300 guesthouses in operation today. The government has recently announced new steps to maintain a structured growth in tourism, including a slowdown in leasing islands for resort development and increased marketing efforts in key markets such as China and the Middle East in order to reach an ambitious target of a record 1.5 million tourist arrivals this year. The continental Special Prize for Exterior – Africa and West Asia in the Hotels category was presented at the grand finale of Prix Versailles held on May 12 at the UNESCO headquarters in French capital Paris. St. Regis Maldives Vommuli Resort was amongst 70 continental winners. Properties from six major regions around the globe — Africa and West Asia, North America, Central America, the South and the Caribbean, Central Asia and the Northeast, South Asia and the Pacific, and Europe — competed for the continental titles. Actively promoted by UNESCO and International Union of Architects, the Prix Versailles has become the World Architecture Award for stores, hotels and restaurants. It is an original initiative launched in 2015 to foster better interaction between the economy and culture. The St. Regis Maldives Vommuli Resort, which was included in the Condé Nast Traveler 2017 Hot List, is nestled on a private island in a secluded Maldivian atoll, amidst thriving marine life. Just 40 minutes from the main Velana International Airport by seaplane, guests are transported into a newfound paradise in the Dhaalu Atoll. The all-villa resort’s unique design, inspired by the marine setting, has been created to evoke a sense of tropical island village living. Each of the 77 villas embody the perfect combination between privacy and luxury. Maldives has won the award for the Best Sea Destination at the Italia Travel Awards 2017. Hala Hameed, the Permanent Representative of Maldives to the UN offices in Geneva and Ambassador of Maldives to Swiss Federal Council, received the award at the gala ceremony held Thursday at the elegant Roman Aquarium located in the heart of Italy’s capital Rome. Maldives won the award for the Best Beach Destination last year, competing with Seychelles and Polynesia. 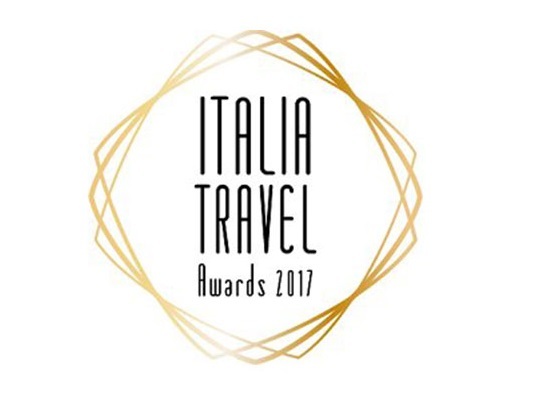 Considered to be the Oscars of the travel industry in Italy, the annual Italia Travel Awards celebrate the commitment and expertise shown by the Italian tourism sector. The awards aim to encourage and boost professionalism and quality of the tourism industry. The Italian market, which is one of the major source markets for the Maldivian tourism Industry, has shown signs of recovery from 2015 onwards after four years of decline, with market share increasing from 4.8 percent in 2014 to 5.5 percent in 2016. In 2016, 71,202 tourist arrivals were recorded from Italy, which is an increase of 8.5 percent compared to 2015. 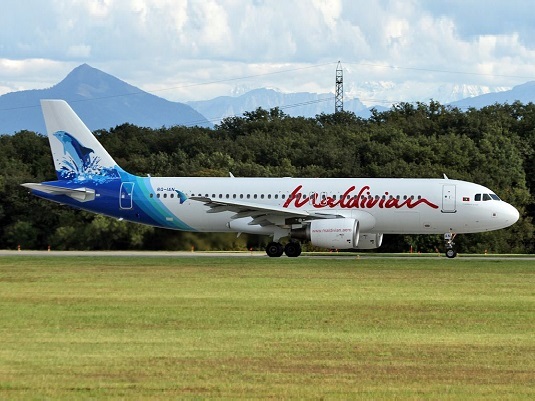 Maldives national airline Maldivian has announced plans to start operations to new destinations in China. Abdul Haris, Managing Director of the airline’s parent company Island Aviation Services Limited, told local media on Sunday that new cities in China would be added to its list of destinations later this year. The new destinations would be serviced by a new Airbus A321 aircraft. “We are in the process of finalising the lease. Once we get the aircraft, we will also increase the number of flights to Bangkok and Trivandrum,” Haris was quoted as saying. Maldivian currently flies to six cities in China; Changsha, Chengdu, Chongqing, Nanjing, Wuhan, Xian. The new routes are expected to boost tourist arrivals from China, which has maintained its position as the single biggest source market. In 2016, Maldives welcomed 324,326 visitors from China. Maldives crosses another milestone in the tourist arrival target of Visit Maldives Year 2016 with the welcoming of 750,000th tourist. 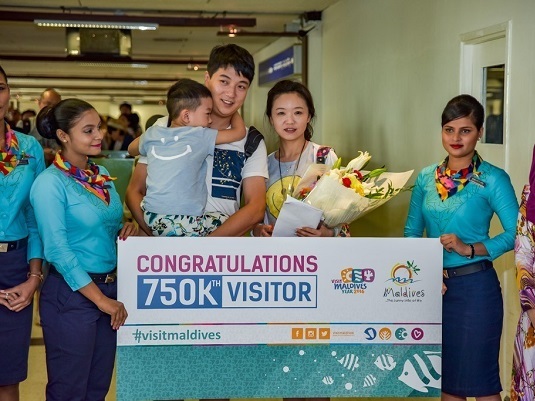 Mr Wang Shuai, a Chinese tourist was the distinguished 750,000th tourist to the Maldives who arrived with his family at 06.53 hrs this morning on a Maldivian flight from Xian, China. Wang Shuai and his family were warmly welcomed by the Honorable Minister of Tourism, Mr. Moosa Zameer Hassan, H. E. Mr. Wang Fukang the Ambassador of China to Maldives together with senior officials from the tourism industry, Ministry of Tourism, Maldives Marketing and PR Corporation, Maldivian, Maldives Airports Company as well as the Maldives Immigration, at a ceremony held at the airport VIP lounge. Wang Shuai was presented with a commemorative plaque and a holiday in the Maldives sponsored by Meeru Island Resort & Spa. During the interview given to the media today by Wang Shuai, he expressed his excitement towards being the 750,000th visitor to Maldives. On this second trip to Maldives, he shared that his first trip to Maldives was for his honeymoon. He is also thrilled to have received the opportunity to experience Meeru Island Resort & Spa with his family during his next trip. 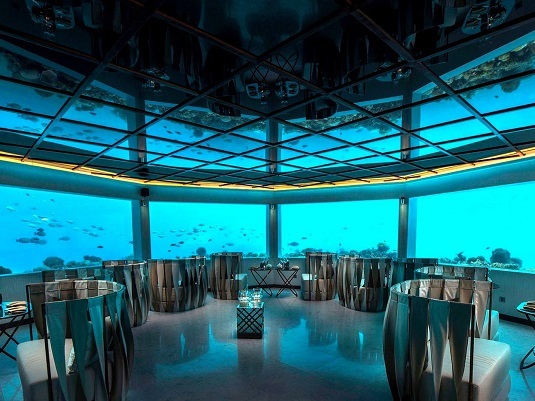 OZEN by Atmosphere at Maadhoo has launched its underwater dining Experience at the resort’s underwater restaurant M6m. The M6m which means 'Minus 6 meters' is specialising in gourmet seafood dishes. Led by the resort’s creative Executive Chef Arun Katoch and M6m’s own master chef Chaitanya Sharma, the restaurant serves some of the finest modern seafood cuisine in a mesmerizing underwater setting. The dishes are created using quality ingredients and fine-dining cooking techniques. Star dishes include Seafood Ceviche, Baked Langoustine and Lobster Thermidor. The cuisine blurs the line between gastronomy and art, the resort promises. The restaurant is open for lunch and dinner. As well as the underwater restaurant the resort offers 3 dining options: THE PALMS, THE TRADITIONS – IndoCeylon, THE TRADITIONS – Peking, and Joie de VIVRE. OZEN also introduced an exclusive All-inclusive luxury holiday plan, the Atmosphere INDULGENCE™ that offers a blissful hassle-free holiday experience. OZEN by Atmosphere at Maadhoo welcomed their first guests on 15 July. Located in Kaafu atoll, the luxury resort is 35 minutes away by speedboat from the Ibrahim Nasir International Airport. Malahini Kuda Bandos Resort, the sister property of Bandos Maldives welcomed its first guests in late July 2016. Located in North Male’ atoll, the resort can be reached by a 10-minute speed boat ride from the Ibrahim Nasir International Airport. The resort offers 82 rooms in two categories: Sunrise Beach Bungalows and Garden rooms. Spread over the east side of the island, the beach bungalows offer a spectacular view of the sunrise. With direct access to the beach, the surrounding foliage offers privacy and creates a feeling of seclusion. These bungalows also boast open air showers. The Garden Rooms overlook the gardens of the island and feature simple interior and minimalist furniture. These rooms come with either queen-sized or twin beds along with convertible sofa beds. All rooms are air-conditioned with hot and cold showers, mini bar and free Wi-Fi. Tea and coffee making facilities are available. The resort’s main restaurant Maagaa serves international cuisine, including breakfast, lunch and dinner. Located on the beach, The Bluu serves light meals, and is open late into the night. For a change of scenery, guests also have the option to visit Bandos Resort next door to sample any of the four dining outlets available at the resort. The resort’s bar is located on the beach, offering great views and everything from the classics to customised cocktails. Malahini Kuda Bandos also boasts a spa and gym. 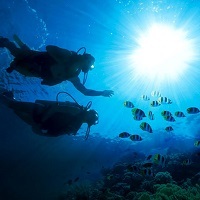 Taking advantage of its proximity to great dive sites, the resort’s PADI-certified instructors will take guests on guided dives and snorkeling trips. Several watersports activities, such as catamaran sailing, Jet Ski, para sailing, canoeing, windsurfing and surfing are available at the resort’s marine and recreation centre. Hospitality and lifestyle brand, Pulse Hotels & Resorts has announced the opening of its new property, Kandima Maldives, in December 2016. The contemporary lifestyle resort in Dhaalu atoll will cater for guests of all ages; couples, families and groups of friends. Kandima offers 274 stylish studios and villas, with eleven room categories to choose from. 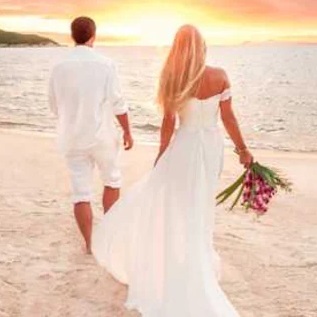 The rooms are located at different points along the 3km long island, making the accommodation suitable for both honeymooners seeking privacy and families looking for activities. All the rooms come with a private terrace offering great views. The two-storey villas named Beach and Sky Studio, are situated along the main beach and comes with their own private terrace or balcony. Guests can choose between a Sky or a Beach studio from 138 studios. The Family Sky Studio offers 6 interconnecting sky studios with a separate living room, and can accommodate up to 8 people. The island’s 30 spacious Beach Villas with Jacuzzi comes with their own private deck, Jacuzzi, and endless ocean views. The Beach Pool Villas offer a private pool, Jacuzzi and private deck. Kandima’s Aqua Villas are over-water with a private deck, offering endless views of the beautiful Indian Ocean. Guests can opt for an Aqua Villa with Jacuzzi or an Aqua Pool Villa. The island also offers a large selection of food and beverage outlets, offering Chinese, Japanese, Mediterranean, and authentic Maldivian cuisine with ten restaurants and bars to choose from. The island also boasts the longest pool in the Maldives, tennis courts, an art studio, marine biology centre, kids club, games room, a library, gym, yoga studio and spa. An endless array of activities and events are also on offer, including watersports, diving or snorkelling near the house reef, yoga, Zumba, bicycles, beach volleyball, petanque, arts and crafts lessons to name a few. Established in 2015, Pulse Hotels & Resorts is owned by Deep Blue Private Limited, an investment company specialising in tourist resorts and other tourism related businesses in the Maldives. Founded in 2005 and with a proven track record of delivering innovative and complex development projects in the Maldives, Deep Blue Private Limited brings decades of experience, expertise, insights, established values and a solid financial base to Pulse Hotels & Resorts. 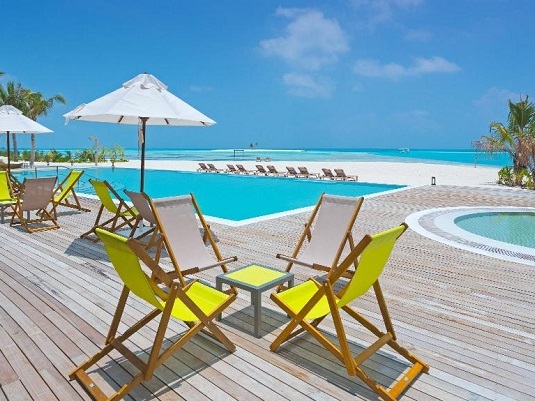 Finolhu, the newest addition to Small Island Co’s portfolio, has welcomed its first guests. Set within the UNESCO biosphere reserve of Baa Atoll, Finolhu is served by the new Baa Atoll airport or can be reached by a 30-minute seaplane ride. The ultimate island experience for chic couples, fun-loving families and groups of friends alike, Finolhu’s 125 villas come on the ocean, the lagoon or by the beach, with or without pool, and are outfitted with Instagram-worthy interiors and vintage-style Marshall speakers, while bathrooms and spa facilities are stocked with all-natural, organic products from Neal’s Yard Remedies. “Finolhu has all the hallmarks of paradise. 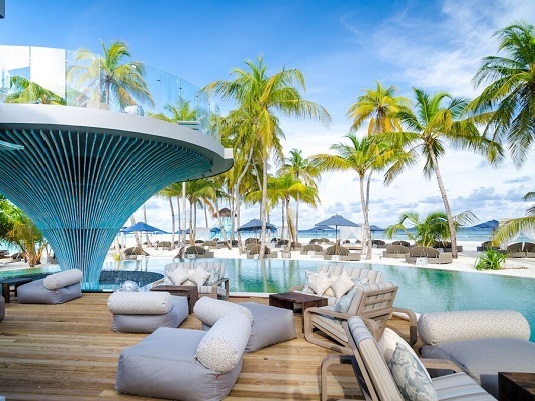 Translucent waters, 1.8km long white-sand bank and perma-clear skies aside, what really sets it apart from its Maldivian competitors is its effortlessly stylish surrounds and beach clubby-ness,” the resort said in a press statement. Located on the tip of the island with sweeping views of the Indian Ocean, Finolhu’s star dining venue Kanusan spans three areas: a vibrant overwater bar area; a relaxed indoor space and an al fresco lower deck for an archetypal Maldivian experience surrounded by the sights and sounds of the sea. An open kitchen puts the cuisine centre stage, embracing the theatricality of Kanusan’s Asian spirit. Finolhu and Amilla Fushi are owned and developed by The Small Maldives Island Co, part of the Coastline Group of companies. The Small Maldives Island Company’s focus is on resort management in the Maldives for Coastline Hotels and Resorts. Established in 1994, the Coastline Group is engaged in logistics; oil importing, storage and distribution; pilling and construction; building material supplies; hotel resort development; condominium development; airport ownership, development and operation; and luxury yacht and boat manufacturing. It is the largest importer and distributor of Fuel Related Products such as Marine Gasoil and Mo Gas to resorts in the Maldives, servicing 65 per cent of the country’s resorts through its company Asian Gasoil. In addition to building both W Maldives and Huvafen Fushi, Coastline’s recent developments within the tourism sector include Mudhdhoo island, subsequently acquired by Dusit Thani Hotels; Baa Atoll’s Dharavandhoo Airport; and the newly opened Raa Ifhuru Airport. 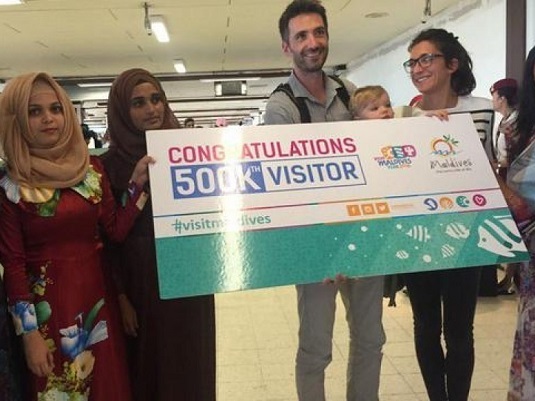 The Maldives Marketing and Public Relations Corporation together with the Ministry of Tourism welcomed the 500,000th visitor of the year 2016 to Maldives on the 1st June 2016. This event is part of the Visit Maldives Year 2016 campaign which commenced at the beginning of the year with the welcoming of the 1st Visitor to Maldives in 2016. The 500,000th visitor of the year, Mr Nicolas Lamperin, from France who arrived with his family on an Emirates flight, was welcomed by the Acting Managing Director of MMPRC, Mr. Haris Mohamed, who awarded him with a free holiday at Banyan Tree Vabbinfaru and a commemorative plaque. Officials from MMPRC and the Ministry of Tourism attended the event which took place at the Ibrahim Nasir International Airport. 21,178 French tourists have arrived in Maldives from January till April 2016, contributing to 4.7% of the market share. Visit Maldives Year 2016 is a yearlong campaign to boost tourist arrivals to the destination, with the target of reaching 1.5 million tourist arrivals during the year 2016. Numerous international and local events, competitions and awareness programs will be carried out by MMPRC together with the Ministry of Tourism, to create awareness among tourists and locals, and to display the richness of Maldives as a unique and exotic tourist destination. Available to guests at Anantara Dhigu Maldives Resort, Anantara Veli Maldives Resort and Naladhu Maldives, Aquafanatics is the first PADI-certified free diving centre in the island nation. Launching a country first, the free diving centre offers another dimension to ocean-based adventures on the islands. 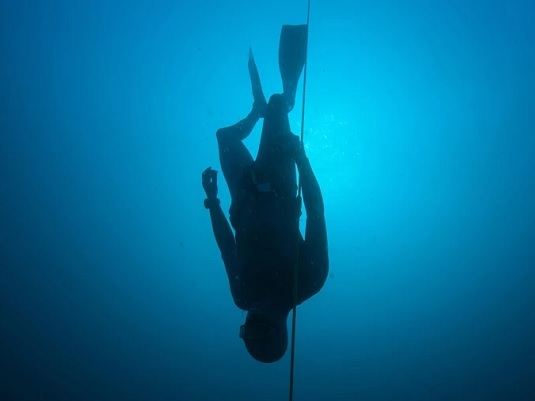 The less explored activity of free diving strips many restraints attached with traditional scuba diving. A truly liberating activity, it relies on the diver to hold their breath, leaving them free to move unhindered through the translucent Maldivian waters. With no oxygen tank bubbles to distort vision, the vivid colouration of coral life glows brighter than ever. Devoid of heavy equipment, guests move at will alongside inquisitive fish, developing a sense of belonging. With every dive guests acquire the ability to stay below a little longer, discovering more on each descent. 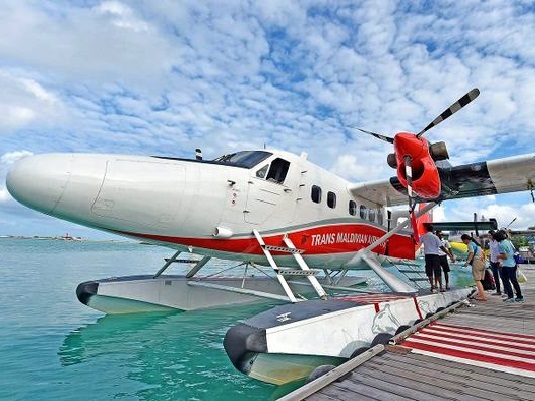 Trans Maldivian Airways introduced the first air-conditioned twin otter seaplane service in Maldives.This twin otter aircraft is a 8 seater equipped with onboard airconditioning which cools the cabin. Interior of this aircraft is different from the rest of the fleet with its design being of a VIP configuration. 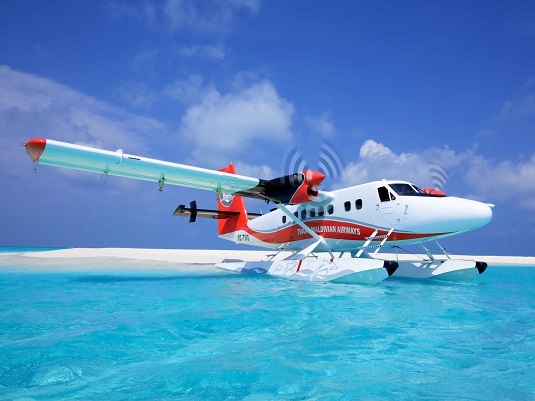 The luxury air-conditioned seaplane service is the first of its kind in the Maldives and will undoubtedly contribute to the satisfaction of passengers. 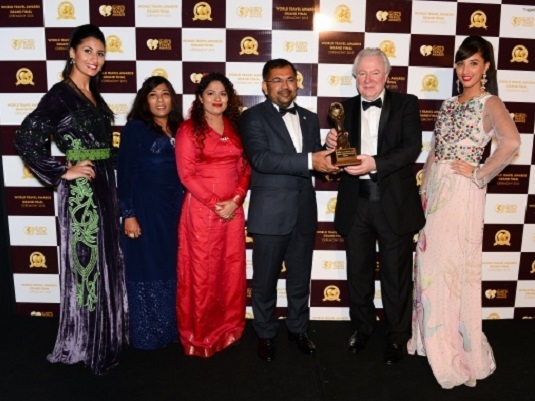 Maldives wins the prestigious position of the Indian Ocean’s Leading Destination at the 23rd edition of the Annual World Travel Awards; Africa and Indian Ocean held on 9th April in Zanzibar, Tanzania. Maldives once again secured the prestigious position as the Indian Ocean’s leading Destination after having won the title also in 2015.
the World Travel Awards are the most comprehensive and most prestigious awards program in the global travel industry. It was established in 1993 to acknowledge and celebrate excellence in the world’s travel and tourism industry. The Indian Ocean category was introduced in 2003. Since then, the Maldives had won prestigious positions in various categories over the years. 2016 Award series is yet again another tremendous year for the Maldives as a tourist destination. Being a winner of most awards in the most prestigious categories truly bench marks the destination profiling at the highest level. One of the main events of Visit Maldives Year 2016 includes the Maldives hosting the World Travel Awards Grand Finale of 2016. Saudi Arabian Airlines has started flights to Maldives. 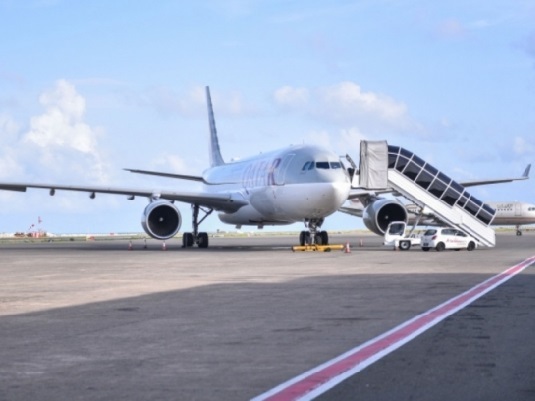 The maiden flight to the Maldives was welcomed with traditional water cannon salute at the Ibrahim Nasir International Airport on Wednesday, 30th March morning. Saudia will fly twice a week service on Wednesdays and Saturdays from Riyadh’s King Khalid International Airport to Ibrahim Nasir International Airport at Malé. The sector is served by an A330 aircraft configured with 26 business class seats and 252 economy seats. Special introductory fares start from USD 550. Saudia, legally Saudi Arabian Airlines, is the flag carrier airline of Saudi Arabia, based in Jeddah. The airline is the third largest in the Middle East in terms of revenue, behind Emirates and Qatar Airways. It operates domestic and international scheduled flights to over 120 destinations in the Middle East, Africa, Asia, Europe and North America. Saudia is a member of the SkyTeam Airline Alliance. The inauguration of the upcoming major project to develop the Maldives main airport will be held April 6 at Dharubaaruge convention centre, announced the airport operator Maldives Airports Company (MACL). The Managing Director Adil Moosa stated Monday that acquisition of contractors and signing of loan agreements for the development of Ibrahim Nasir International Airport (INIA)’s new runway, fuel farm and other facilities have already been completed. Preliminary work of the project will commence next month. Meanwhile, MACL is also currently evaluating proposals submitted for the development of INIA’s new terminal. MACL reported that the project contractor is carrying out soil tests in the designated area, while plans on proceeding with the runway project are currently underway. MACL had earlier stated that with the construction of the new runway, the current runway will be converted into more of a taxiway. 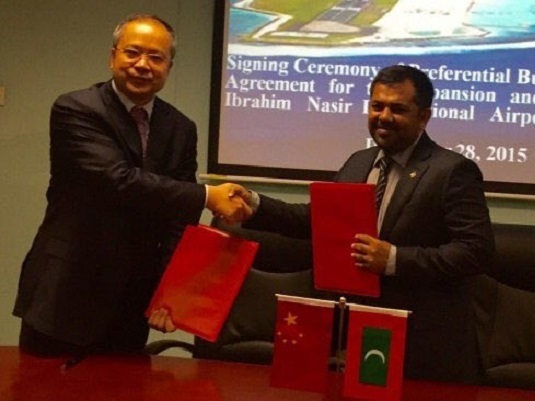 The Maldives government had signed an MOU with China’s largest construction corporation, Beijing Urban Construction Group (BUCG) last August for the development of INIA’s second runway, which will measure 3.4 kilometres in length. BUCG is renowned for the development of several airports in China and the Beijing National Stadium (Bird’s Nest). INIA’s new runway project also encompasses land reclamation and the development of a state-of-the-art fuel farm. Currently INIA boasts a fuel farm of 15,000 metric tonnes, which the project will convert to 45,000 metric tonnes, according to MACL. In addition, two foreign contractors have submitted proposals for the development of INIA’s new terminal, a project with a budget of USD 300 million. MACL announced Sunday that they will sign the agreement with the project’s contractor at the end of April or beginning of May, and that the project will be underway within this year. Uduvilaa, the picturesque restaurant located at Hulhule Island Hotel, Maldives (HIH) has excelled at the international level by bagging the prestigious Best Hotel Restaurant Staff Worldwide 2015 from Hotel of the Year Awards 2015. HIH, which by itself is a short ride from the international airport, has Uduvilaa nestled on the top-storey of the hotel’s Deluxe Wing. As you step into the restaurant, you already start feeling the vibes that you are in for a wonderful experience. Charming hostesses lead you to your dining table and at first you are in a dilemma whether to appreciate the restaurant’s chic and modern ambience or the natural, panaromic and almost 360 degree views through the floor to ceiling windows! After a while you realize that the rich teak and warm purple interiors not only blend but complement the beautiful views on the other side of the glass. Overall, if you are looking for a complete dining experience for yourself and for your guests and are looking for some extra wow touches and moments of truth, just place yourself into Uduvilaa and enjoy the superlative restaurant experience. Hulhule Island Hotel has won numerous international awards in the past few years, the most prestigious being ‘World’s Leading Airport Resort’ over last three years. Utkarsh Faujdar, General Manager said, “The superlative team has played a major role in the overall success of hotel and winning the prestigious ‘Best Hotel Restaurant Staff Worldwide 2015’ is definitely well deserved”. The Maldives Marketing and Public Relations Corporation together with Ministry of Tourism endures the Visit Maldives Year 2016 campaign by celebrating the Chinese New Year on 8th February 2016 in Maafushi Island. Chinese New Year is an important Chinese festival celebrated at the turn of the traditional lunisolar Chinese calendar. It is also known as the Spring Festival, the literal translation of the modern Chinese name. The event was organized jointly with the Guesthouse Association of Maldives (GAM) and MMPRC to bring out the festival organized. The Chief Guest of the function was The Chinese Ambassador to Maldives H.E Wang Fukang. It was attended by many officials from MMPRC and Ministry of Tourism as well as a number of major industry stakeholders. 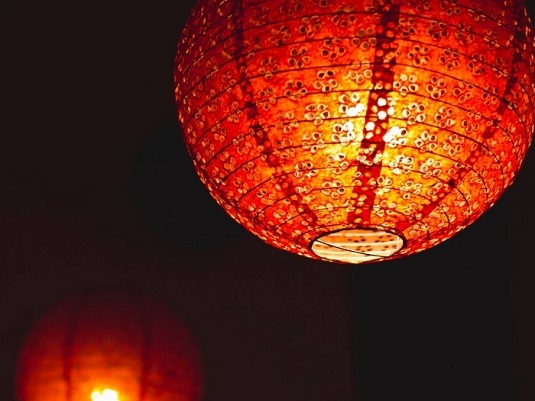 Making the most of this event, a gala dinner at night was open for all tourists in Maafushi with Chinese cuisines, Chinese performances and Maldivian cultural performance such as Boduberu and cultural dances. The Visit Maldives Year 2016 will be a year long campaign to boost the number of visitors and tourism receipts of the country. 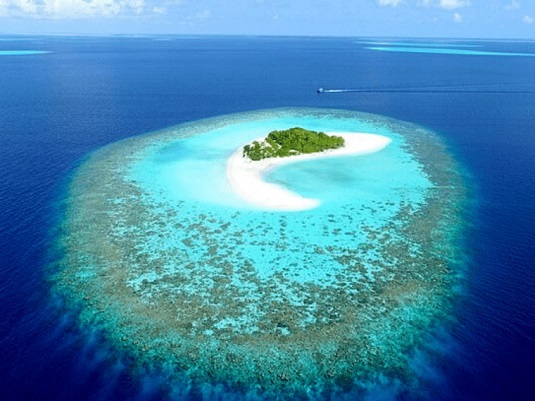 Chinese market holds almost 30% of the market share to Maldives helping to achieve the target arrivals for 2016. 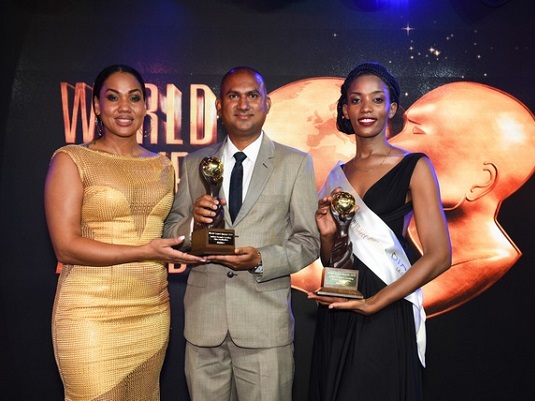 Maldives wins the prestigious position of the World’s Leading Beach Destination at the annual World Travel Awards Grand Final awards ceremony held at the Mazagan Beach & Golf Resort in Morocco on 12th December 2015. Maldives won against 11 other nominees in the category which included world class beach destinations such as Boracay, Cancun, Miami, Thailand and Turks & Caicos Islands. For a destination boasting its natural environment and beautiful white beaches as one of the most attractive product elements for visitors, winning the title will definitely strengthen the destination profiling as the best beaches on offer for an international audience. Moreover, Maldives also won the prestigious positions. World travel awards are well-known as the highest and most exclusive award ceremony in the Travel and Tourism Industry. It is also renowned as the “Oscars of the Travel Industry.” Today, the World Travel Awards™ brand is recognized globally as the ultimate hallmark of quality, with winners setting the benchmark to which all others aspire. With the winning of these awards, 2015 Awards series is yet again another tremendous year for the Maldives as a tourist destination. Winning awards in these prestigious categories truly bench marks the destination profiling at the highest level as Maldives gears up for the Visit Maldives year 2016. While this year marks the 22nd anniversary of the World travel Awards, Maldives was honored the opportunity to host the World Travel Awards Grand Finale 2016 as one of the main events of Visit Maldives Year. To host the most prestigious event of the travel and tourism industry will indeed strengthen brand Maldives…sunny side of life. All in all, with grand tourism celebrations, 2016 will be a momentous year for the tourism industry of Maldives. Having launched the Amilla Fushi resort earlier this year, The Small Maldives Island Company has unveiled details of its sister resort, Finolhu, which is scheduled to open in summer 2016. Located in the Baa Atoll, Finolhu will be a 'refined, retro-inspired' resort, according to the company, located 30 minutes by speedboat from Amilla Fushi. The property will feature a range of one- or two-bedroom villas, with beach and over-water options. There are seven villa types to choose from, some of which offer private pools. The Small Maldives Island Co. has once again teamed up with famous Australian chef Luke Mangan, who will launch the Fish & Crab Shack at Finolhu. The company said the restaurant would be an 'island outpost of Salt Grill', Mangan’s restaurant in Singapore. Other F&B outlets will include Baa Bar and Dining, offering al fresco meals, Kanusan, which specialises in Asian cuisine, and the Baa Baa Beach Club. The main entertainment area of Finolhu will be The Cove, a retro-style relaxation area which will feature a fitness centre, yoga pavilion, an outdoor ‘jungle gym’, retail pavilion, steam room, sauna, salon, and activities such as ballet and kickboxing. There will also by a water sports and dive centre and a children’s activity centre. 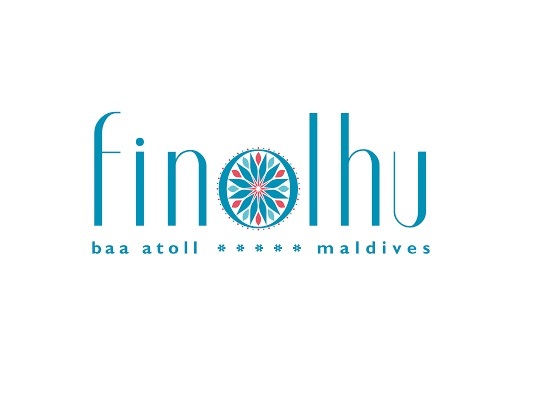 Both Amilla Fushi and Finolhu are owned by Coastline Hotels & Resorts, which forms part of Maldivian conglomerate The Coastline Group. Maldives has topped a list of 20 island destinations most favoured by Chinese tourists, who have been the world’s No 1 cross-border visitors for the past three years, spending billions of dollars on outbound tours. The announcement was made at the 2015 International Islands Tourism Conference in east China’s Zhejiang Province. Taiwan, Bali, and Thailand’s Phuket Island have also been favoured by Chinese tourists in the list, which was created after a poll by the conference’s organisation committee and after evaluation by an expert panel. The poll began in June, drawing more than three million responses for more than 70 destinations. The poll was conducted via the committee’s website, and some other portals and microblog services. Chinese islands filled five spots on the list, state-run Xinhua news agency reported. China has been the world’s No 1 source of cross-border tourists since 2012, according to the World Tourism Organisation. In 2013, the organization said, Chinese outbound travelers spent a total of USD 129 billion. China’s outbound tourists made nearly 24 million trips to islands in 2014, and the number is likely to exceed 30 million this year. China’s outbound tourism has grown dramatically in recent months despite its economy economy contacted sharply. The World Bank recently revised its projections for China’s economic growth from 7.1 per cent to 6.9 per cent. The conference, which was held in Zhujiajian Island of Zhoushan City, was organized by China’s National Tourism Administration and the provincial government of Zhejiang province.